Know some basics about Windows 7 . 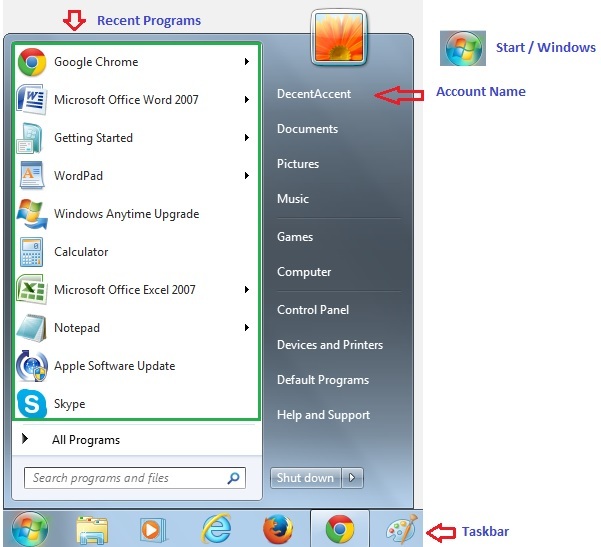 In windows 7 you can search all programs from Start / Windows tab. When you click on Start tab it will open a list of recent programs and some default basic shortcuts on right side of pop up window. If you hover mouse cursor on ‘All Programs’ tab for couple of seconds or left click on it then it will show all available programs list in your PC. If you hover mouse cursor on arrow next to ‘Shut down’ tab then it will open more options such as ‘Swithc user’, Log off’ , Restart , etc..
2. How to Change Screen Resolution? Click and Open drop down list for Resolution, Move slider to your desired resolution. Note: If you use dual monitor then you need to set resolution for both monitors. Click on monitor number and then adjust slider for resolution.